Use vials with screw tops, microcentrifuge tubes, or counting slides before putting them inside a labeled Ziplock bag. The laboratory only accepts extracted phytoliths. Pretreatment – Generally no pretreatments are applied in the lab and we analyze the submitted material. However, we will test a sub-sample for carbonate with an acid wash or, upon instruction, apply a full acid wash in the case of known carbonates. Phytoliths submitted in extracted, isolated, and clean form can be routinely dated using 200-400 milligrams. On occasion the Micro-Sample AMS service is required. Our methodology to produce a date representative of the time of formation of the phytoliths is dependent on (1) the purity of the phytoliths submitted or (2) the age of the other organic materials the same age as the phytoliths if pure phytolith is not possible for dating. The confidence in the AMS dating results depends on the submitter’s confidence in the integrity of the samples. 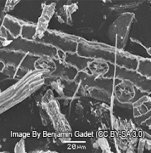 According to the Smithsonian National Museum of Natural History, phytoliths are microscopic pieces of silica that form in the cells of many kinds of plants. They stay well-preserved even after the plants die and decay. Because of this unique feature, phytoliths are used by archaelogists and paleoecologists to identify plant remains in varied contexts. Dr. Dolores Piperno, a member of the National Academy of Sciences, is credited to be one of the first few researchers who used phytoliths in an archaeological context. In her research, phytoliths were used for documenting prehistoric agriculture in tropical zones.